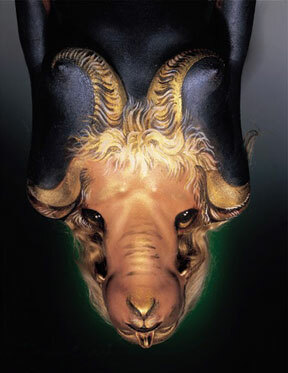 Above, Capricorn from the Astrological Bodies series, © 2003 all rights reserved. This is the first time I've posted a monthly horoscope in January along with the annual edition. My apologies for the delay in the posting. It's not just Mercury retrograde. I've been on the mend from some long-overdue surgery and have been devoting a lot of energy to my healing process. It's been an intense, at times difficult month, but I'm feeling better. I am indebted to the people who have helped out again and again, including Mary Walker, Chelsea Bottinelli and a few of her friends, Jordan Laughlin, Jeanne Treadway, Denice Taylor, Carol Burkhart, Gail O'Grady, Pam Purdy, Polly Carson and many others. It has been a trip. Thank you all. So hey -- as for business -- you will notice a gradual shift over the next couple of months to more astrology media products available on Planet Waves. If you're on one of our lists, look out for the marketing survey so we can get a sense of what would turn you on. The first two of these products, the 2003 annual CD and the weekly horoscope newsletter, are currently available as a package deal for $55 for a one year subscription -- priced separately at $75. This package offer is available by phone order only, with payment by check or credit card. The number to call is (206) 463-STAR (7827), located in Pacific Time, which is three hours EARLIER than New York. I do love talking to you at 5 a.m. but after 8 or 9 is better. The weekly horoscope newsletter has turned out to be a hot, surprisingly excellent and rather comprehensive astrology product. If you're interested in subscribing, please email Chelsea at chelsea@planetwaves.net or call her during business hours at (206) 463-STAR (7827). Soon the horoscope and newsletter will become two separate products, sold to new subscribers separately. To subscribe to the complete horoscope and newsletter now as an original subscriber (you will continue to get both), you'll need to sign on this month. Being an original subscriber will protect your subscription rate. If you'd like to see a free sample of the newsletter, drop us a note using this link -- it automatically includes the words "sample issue" in the header so we know to send you one. We'll be back with another update by the 1st of February. Eric will be working in-person with clients near Sacramento, CA February 10 and 11 (Monday and Tuesday), following a two-day Loving Presence / A General Theory of Love workshop by Ron Kurtz. New clients in the Sacramento area are welcome. If you're interested, please contact Chelsea at (206) 463-7827. Thank you! Revisions in your career plans will take up much of your time this month, but make sure it's time well spent. There is no need for a long hunt or investigation about something you're missing from the past when you know exactly what it is already. But an extraordinarily careful review of history, including what you have counted as your most significant successes, failures and innovations, would be more than productive. You are looking for a pattern, and the pattern is going to reveal a formula. I don't mean a formula that you follow like a recipe. I'm talking about what you identify as the spiritual alchemy that is always present at the time of a breakthrough. If you happen, at any time in your research, to notice that this particular energy is around you, remember to take your moment. You have long defined yourself as a staunch survivalist, which has included a substantial measure of refusing to change as an element of your character. But that, as you are seeing, no longer contains the meekest promise of success. It would all be very daunting if something else had not replaced what you once believed was stability, and if it were not perfectly clear that your past ideas of safety and shelter offered you no protection. You are quickly approaching a point where it will be possible to give up on caring what other people think, which as you know has been a major hindrance in the past. In the end, what people think does matter, but caring is somewhat more pointless because you can't change their opinions. It is more than adequate that some people feel strongly enough about you to assist you in any way they can. Accepting that help would count for something new. The charts keep saying you're on a quest for some critical and perhaps very long-buried inner secret, and they keep saying you're getting closer to it. Last month's eclipse may have brought a breakthrough, but even that had some of the feeling of looking straight at something very difficult to recognize or too big to see clearly. If you would make friends with the truth that almost all long-forgotten causes, events and feelings are associated with some degree of pain, then you will find it much easier to get the insight you are seeking. One thing we can say for sure is that few people in this world are moved by anything but pain, thus, it remains a primary cause of most actions and effects. That alone is enough to put a wind beneath your wings, if you hold the thought that you're truly free to live your own way. Keep your eyes open and be vigilant for what is revealed in the darkness. All the distractions, people and events of your current life are concealing something obvious from you. That something is the influence you exert over both people and events without really making any effort to do so, no matter how influential you may feel that other people are in your life and beyond. There is more equality in this world than certain people or entities would have us think; and with that, there is more balance of influence. The issue is merely one of awareness of how that influence works. The ways of the world are poised to reveal themselves to you. Or at least a few choice ones are. Maintain your focus on doing things right, which at the moment means the way they have been done in the past. No growling. Soon enough you'll see a way to accomplish your goals by very different methods, but the initial path to getting there is one of utmost tradition and reserve. There? Well that's the main difference. There is someplace else besides were you've been or what you've done. But you'll need to use the anchoring-in-stone property of Capricorn that's so different than anything Leo really has to offer itself. When things start to grow, change and become whatever it is they will become, you will be very happy about that foundation. Events early in the month appear as a recall on a romantic or creative product that demands a second look before anything develops too much. Such things have a life of their own, as you know, and it's better to get a grip on reality while you still have a chance to make decisions that don't cause major disruptions for others. No matter what else you may be feeling or feel pressured to do, you still have the freedom to choose. The catch is the choices may turn out to be a bit larger than you were planning, or were thinking you could muster the maturity to endure at this juncture. Larger, as in, if you draw the lines and connect the dots, you'll see how much is at stake. It would seem these days that your sensitivity is putting certain limitations on your freedom. It's all adding up to a big tease, and an uncertain picture of whether being a little too free or a little too secure is the right thing to do. I find the dilemma troubling; presuming it's an accurate description, who divided experience into safe and free? We do see this split operating in the world all the time, but you are approaching a very opportune moment to question it. It is never action that counts, but only the value placed on that action. What you do tomorrow will have a very different meaning than if you had done it today. What if we were to think of marriage as a muse we invoke when we initiate a long-term partnership? A muse is a patron spirit of a particular art form, and partnership certainly qualifies. If you pay close attention to the essence or feeling-tone of this spirit, you're likely to notice a few different qualities this month than you might ordinarily. What is the quality of faith that it offers? Is its vibration male or female? And what would this spirit do with the innumerable past hurts that you have suffered, particularly given that vulnerability to pain is a quality of any relationship in which hearts are open? The answers to these questions may tend to change over the next few weeks, but if you listen you will hear a distinct theme, and likely notice that one voice is responding. Jupiter holding a long trine to Pluto is what you could call a 'good thing', especially for you with both in the fire signs. We need to make sure it's an honest thing, and the way that's going to happen is by the time-honored and astrologically-beloved test of time. The question, how deep is your faith? is precisely the matter. To be sure, faith is not a game; it is one of the few things that really matters on this plane of reality. That it is not a game means that the tangible basis of faith is understood, particularly as it relates in contrast to some of the less credible darker thoughts you've been pondering. In other words, your faith is not about speculation, and it never was. You now have a fine opportunity to change your mind. If someone else does so first, the decision may be final. Embrace the perfection of this moment in all its doubtful splendor. We can never be sure if something is ultimately right or wrong, until we experience the ultimate; that, fortunately, is a ways off. For now you will need to content yourself with looking through large cracks in the façade of false-reality that still may not be picture windows or wide-open doors. But you can see enough, and clearly enough, to know that another world is possible. Beware, and I mean it, of defending or otherwise adhering to your beliefs. They are not going to help you now, and they can do considerable harm. Know what they are and don't even spend too much time wondering if they're true. That's not the point. Your current zeal for honesty has a potentially violent quality. If you can, reverse your course because if you don't, what you learn may repel your awareness rather than turn it on. And you need all the awareness you can get right now. Or to put it more effectively, you need to remove anything you discover that's a block to your awareness. It might be a value, a person, an addiction, or an idea. You have everything you need to solve your own problem, which is fundamentally a creative problem -- if only you could create this one solution, you would have it made. You can, and you will, as long as you keep moving through the obstacles that you've laid for yourself, granted, without meaning to.